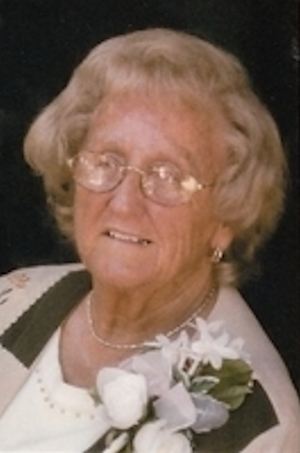 Obituary – Ewy, Harriet Maxine (Taylor) « Perry High School Alumni Association, Inc.
Ewy, Harriet M., 86, homemaker, died May 18. Graveside services 2:30 p.m. Thursday, Resthaven Memory Gardens (Vondel L. Smith & Son South, Oklahoma City). A life well lived with grace, generosity & love is a tribute to The Lord & to the world. Harriet Maxine Ewy was a Christian, wife, mother, grandmother, great grandmother, friend & homemaker. Harriet, 86, went to be with the Lord on May 18, 2015. She was born September 11, 1928, in Sacramento, CA to Harry & Mae Taylor. She graduated from Perry High School in 1948. Harriet then married L.D. Ewy & they shared 41 years together raising their three children. Harriet loved her family deeply. She was accepting, caring & always had an ear for anyone who needed to talk. She was quick to listen & quick to give you a hug. The world has truly lost a gentle soul. She will forever be missed. Harriet is preceded in death by her parents; husband, L.D. Ewy & grandson Jered W. Ewy. She is survived by her son, John Ewy & wife Ann; daughter, Carol Smith & husband Tom. Harriet is also survived by her six grandchildren, Penny Clark & husband Rob, also known as “Ron,” Dustin Smith & wife Louise, Kelly Smith, Jeff Holland & wife Amy, Jason Holland & Michelle Davis. Harriet also has ten great grandchildren & numerous other family members & friends whom she loved & who will miss her greatly. The family would also like to thank the many caregivers Harriet had over the years. The family would also like to extend a special thanks to the staff of Visiting Angels, Tina Beene, Teri Arquilla & Jenny Jackson. Your love & dedication helped her in so many ways. Graveside services to celebrate her life will be 2:30pm, Thurs., May 21, 2015, at Resthaven Memory Gardens, 500 S.W. 104th St.